One 50-lb plastic-shell rear wheel weight may be installed on each rear wheel to provide extra traction and stability. The outer shell is molded of tough polyethylene plastic filled with a heavy granular material that contains a high iron percentage. A bonding substance is added to hold the material together so that it will remain intact, even if the shell is damaged. 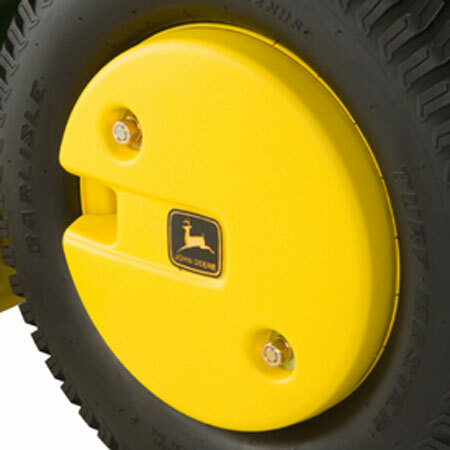 Overall width of the tractor will be increased by approximately 2 in. (51 mm) when weights are installed. For 23x10.5-12 and 24x12-12 tires in narrow position only. Weights are packaged one per carton, with necessary hardware for installation on a wheel. The product seems to be well made and was easy to install on my 1025R. It will help add weight to the back of the tractor when I'm not using a rear implement. I've experienced excellent service and response from your company and have found the best prices on tractor equipment. Great product exact fit looks great and fast shipping great company to do business with.